In existing studies of the historical Jesus, it often appears that Jesus sets out with a fairly clear understanding of what he is to do, and maintains that basic understanding until his death. Martin suggests, however, that the traditions preserved in the gospel accounts are best understood as revealing a man who, early in manhood, becomes aware that God has special task for him and than struggles to understand what that task is and how it is to be carried out. 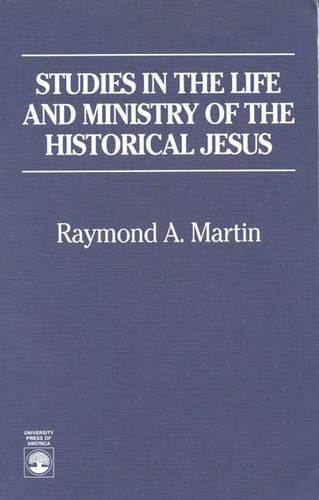 Studies in the Life and Ministry of the Historical Jesus seeks to trace the modification and development that Jesus' thinking appears to undergo in that process. Contents: Preface; Introduction; Jesus' Birth and Early Years; Baptism by John the Baptist; From Baptist to the Imprisonment of John; Jesus' Final Trip to Jerusalem; Epilogue; Appendix 1; Syntax Criticism of Q Material; Appendix 2: Summary of Changes in Jesus' Eschatological Expectations; Notes; Bibliography; Indices.